Vishwas Mudagal is a globally renowned CEO, Serial Entrepreneur, Bestselling Author and an Angel Investor with a history of building innovative brands and sustainable companies. Vishwas has always been a youth icon influencing millions of lives. Having spoken at numerous corporate events, college fests, conventions and literary festivals across India and the world, including popular TEDx talks, he is currently one of the most popular inspirational and motivational speakers in India. 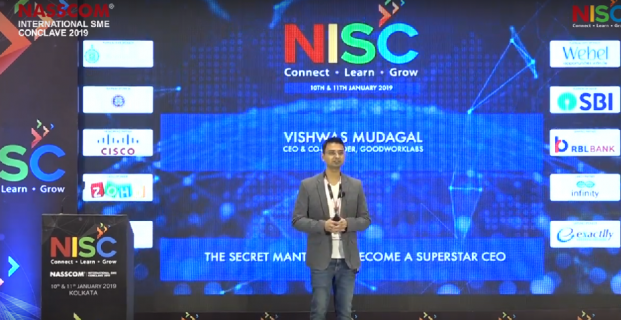 This time he took the crowd by storm by sharing “The Secret Mantras to become a Superstar CEO” at Nasscom SME mega-event NISC 2019. From his own learnings & experiences, he has successfully come up with the 7 golden formulas to achieve success for businesses and professionals in today’s world and the future ahead. 1.) Sales should be in your DNA: No matter how much you grow as a business, The CEO should never let the Sales edge in him tarnish at any point in time. Vishwas Mudagal- CEO, GoodWorkLabs is an active member of the sales team till date & that truly is an inspiration! 2.) User Empathy: Focus on customer pain points & think of an out of the box idea to resolve their issues. There’s a real-life experience that Vishwas spoke about. click to know more. 3.) Always focus on building relationships than on mere transactions: Believe in growing with the customer’s success while working together for a longer term instead of focusing on short term transactions. At GoodWorkLabs, we live by this thumb rule and there’s one very interesting example quoted by Vishwas in this video. 4.) Become an influencer: Put out great content that is relevant for your audience on social media and web. This kind of marketing is the most critical. When people start following you, they start trusting you and that helps immensely while building your sales strategy. 5.) Networking: Now this is an integral part of any business. In Vishwas Mudagal’s opinion Networking is an investment which sooner or later entitles you to reap its benefits, and he has shared a jaw-dropping experience of how he bagged a 1million dollar deal for GoodWorkLabs, through Networking. 6.) Focus on hiring the right resource: As a company starts growing & expanding in terms of team size, most CEOs don’t prefer to spend time on hiring anymore and that’s a big problem. Vishwas rightly identifies this as a major roadblock in terms of growing as a company and to build the right team & hence he’s always actively involved in the company’s recruitment process to hire the right kind of problem solvers &passionate people for GoodWorkLabs. 7.) Question the status quo in whatever you do: A very interesting story- “The elephant and rope” shared by Vishwas Mudagal to explain how each one of us in the industry is trapped by various mythical chains of pre-set conventional methods of limiting ourselves in terms of exploring & experimenting with something new and how we need to break free from these chains to bring a phenomenal change in our industry & this world. Vishwas is also a highly followed Influencer on social media for all the right reasons. And this video is a Must-watch for everyone who wants to succeed!